The son of the Countess of Salisbury, and therefore of royal blood, Pole was favoured by Henry VIII. He chose exile, however, rather than accept Henry as head of the English Church and wrote a pamphlet criticising the king's conduct. It was while in exile in 1536 that he was appointed a Cardinal; in 1549 he nearly became Pope. Pole returned to England in 1554 after the accession of Mary I. Appointed Archbishop of Canterbury two years later, he nonetheless failed to fully restore the country to Catholicism. Pole died within hours of the death of the queen. He is shown in this portrait wearing his cardinal's robes and a scarlet biretta. Thomas Cranmer, the first Protestant Archbishop of Canterbury, is denounced as a heretic and burned at the stake in Oxford. 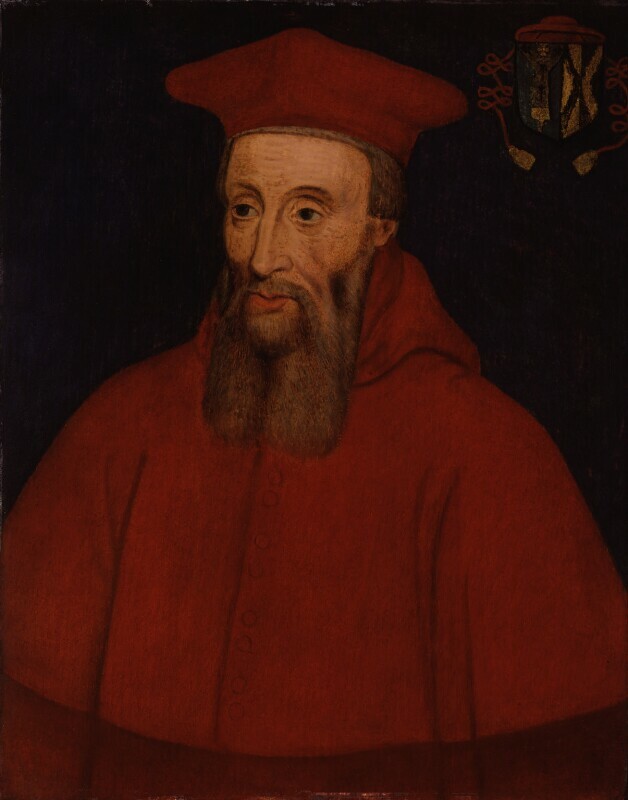 Cardinal Reginald Pole becomes Archbishop of Canterbury. The German physician and mineralogist Georg Agricola publishes De re metallica (On the Nature of Metals), the first systematic treatise about the mining and smelting of metals. It will remain the authoritative text on the subject for 250 years. Abdication of the Holy Roman Emperor Charles V. His brother Archduke Ferdinand of Austria becomes Holy Roman Emperor and his son Philip of Spain, husband of Queen Mary I, succeeds to the throne of Spain as Philip II. Akbar becomes Mughal Emperor of India defeating the Afghans at the Battle of Panipat. The most devastating earthquake in history occurs in China's Shaanxi Province; an estimated 830,000 people are killed.